What do you do when a customer says they’re keen on motorsport??? Take them racing of course! Anthony owns a lightly modified Renault Sport Clio which we’ve tuned for track and road applications. 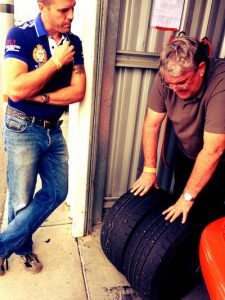 The track setup has helped him to sample Queensland Raceway during Time Attack events and Wakefield Park at the recent Oz Renault Sport Nationals Meet with great success. 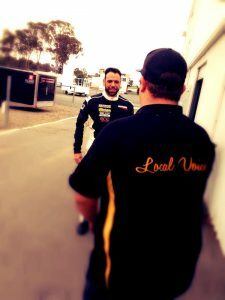 This weekend we asked Anthony to join our team for the Valvoline Winton 300. The event is a gruelling 100 lap race around one of Australia’s most challenging circuits – Winton Motor Raceway. Normally the winning combination is a two driver team however we were keen to help Anthony adjust to the challenge of racing in a 52 car field. 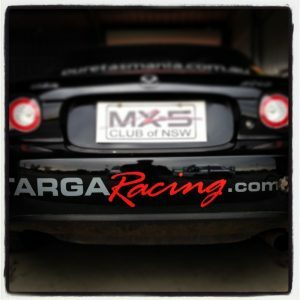 So we invited Anthony to join the very experienced open-wheeler and sports car racer Nick Leontsinis and Chris Romano in a late model Mazda MX5. 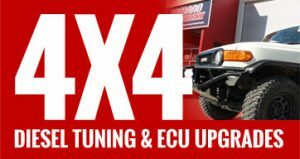 Targa Racing supplied and supported the effort whilst Romano WORKX prepared the iconic two-seater sports car for the epic event. 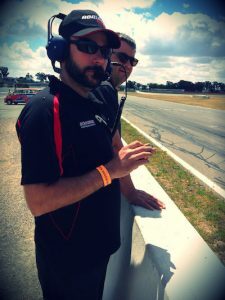 Friday proved to be a real “eye-opener” as Anthony rolled onto a track brimming with a variety of talent and machinery. To the teams delight, he proved to be consistently fast and very aware of the chaotic conditions. Romano and Leontsinis then conducted a number of practice runs to determine setup and fuel burn. Building on Fridays performance Anthony used Saturdays practice to find the limits of the track before handing over to Leontsinis to qualify later that afternoon. Thirtieth position was the reward in a 52 car grid. An amazing performance by Leontsinis in the naturally aspirated MX5 and a great start despite the handicap of running 3 drivers. Storm clouds peppered the horizon early Sunday morning as we awaited the 2pm start. Romano would pilot the first stint with Anthony managing the next before Leontsinis brought it home. Whilst the threat of rain was ever present the rolling start took place on a dry track as 49 starters thundered into turn 1. Romano traded places in the opening laps with a gaggle of BMW’s, GTR’s, Falcon’s, Commodore’s and MX5’s before a safety car was called on lap 12. A quick stop and Anthony was strapped-in for his first-ever race!!! Joining the back of the pace-car lead train Anthony quickly settled into the rhythm of the race before the lights on the safety car disappeared and racing resumed. An eventful stint saw Anthony in close combat with the class leaders whilst allowing the outright cars to pass AND navigating the slower cars from the lower classes. The team had then hoped to pit under another another safety car period in order to negate the disadvantage of the additional pit-stop. After 33 laps the fuel burn became critical and Anthony was directed to pit. The CPS (compulsory pit stop) for fuel is a timed 5 minute event and so the Romano WORKX team regrettably lost a lap to the class leaders. Anthony emerged from the drivers seat surprisingly “sprite”. An amazing effort for a debutant backed-up by consistent lap-times during an incredibly chaotic stint. Leontsinis drove a compelling stint managing to set one of the fastest times in class and almost un-lapping the #115 MX5. Lap 84 and a safety car period ended any chance of regaining the lap. Racing resumed on the 90th lap and the race was flagged on the 95th netting the Romano WORKX team 17th outright and 5th in class. An outstanding result for the team and Anthony whom we’d like to sincerely thank for choosing our team to make his motorsport debut. Now…did someone mention the 2014 Wakefield 300….